"It's vital that self-publishing authors fully understand how they are affected by the new VATMOSS regulations, and take action to protect their income now." 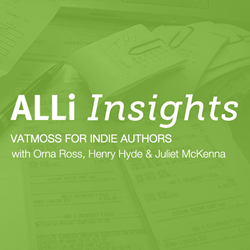 Non-profit professional association the Alliance of Independent Authors (ALLi) unveils an essential February event schedule that will help any author understand the implications of VAT MOSS. New EU guidelines, which came into effect in January 2015, switch VAT obligations from where the supplier is based to where the purchaser is located - a move that has implications for any self-publishing author. In response, ALLi will feature a panel discussion, with ALLi Director Orna Ross joining authors Henry Hyde and Juliet McKenna of EU VAT Action Group. The session will illuminate the main points of VAT MOSS for authors and offer practical advice on how authors can deal with book sales in light of the new regulations. It will also encourage authors to campaign against this legislation, which shows little understanding of small digital business. "The radical change in EUVAT regulations on January 1st 2015 came as a complete surprise to hundreds of thousands of micro-businesses," said Henry Hyde, ALLi Author Member. "It's vital that self-publishing authors fully understand how they are affected and take action to protect their income now." In addition to the online seminar, ALLi has also produced further resources for ALLi members dealing with VAT MOSS, authored by Henry Hyde, which can be downloaded from the member area of the main ALLi website. ALLi’s February event schedule will also include their regular online Q&A session, scheduled for February 24th, at 4pm GMT (London); 9am EST (New York). Featuring Orna Ross and Joanna Penn, the event is a monthly chance for ALLi members to submit their self-publishing questions. ALLi Insights are free to attend educational seminars on self-publishing, with some of the industry’s leading experts. Filled with tips and advice, join us each month as we explore all stages of the self-publishing process, and show you how to self-publish successfully. The Alliance of Independent Authors (ALLi) is the professional association for self-publishing writers. Rapidly growing, this nonprofit organisation brings together the world’s best indie authors and advisors, offering contacts, connection and collaboration plus expert guidance and advice. It also widely champions the interests of author-publishers, within and outside the publishing industry. Director Orna Ross has been named “one of the 100 most influential people in publishing” (The Bookseller).